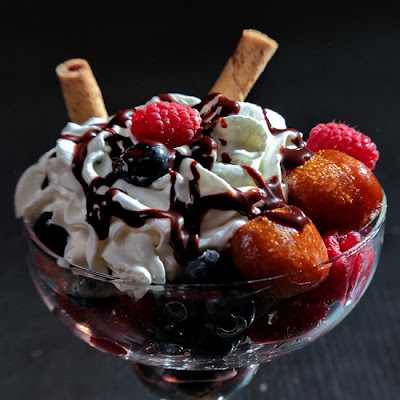 - Mix the fresh berries with a few baba cakes (about three-four cups of fruits to one cup of baba cakes). - Add a bit of amaretto (from the baba cake jar) - it goes well with the fruits. - Serve chilled in a nice bowl, with some rolled wafers in the background. - Just before serving, top with whipped cream and draw a few chocolate lines over.